For several years, the luxury hotel complex, located on the South Pacific island of Bora Bora, has implemented an ecological business approach. Renowned for its white sandy beaches, its turquoise water and overwater bungalows, the Four Seasons Resort Bora Bora wanted to go a step further in protecting this stunning environment by investing in a solar PV system. The beachfront resort decided to pursue a 600kWp commercial photovoltaic system installation to help reduce its carbon footprint and to protect the beauty of its environment. However, the advantages of a photovoltaic system at this particular site extend far beyond the environmental aspects. Bora Bora is a remote island of French Polynesia that produces the majority of its electricity from power plants that run on diesel. Electricity provided by the local utility company, EDT, is very expensive because of the high operating expenses on the island and the high fuel transportation costs to this faraway location. The electricity on Bora Bora can cost up to 41 euro cents per kWh (49.5 francs CFP per kWh). A rooftop PV system would help the resort to better control the costs of its electricity supply. Sunzil was selected for the system engineering and main turnkey construction of the project. As a subsidiary of Total and EDF, it has designed, built and operated photovoltaic plants in the island area since 1986. The PV array was installed on the roofs of two large service buildings inside the resort complex. To accommodate all the solar panels needed, an additional building with an area of 1600m² had to be built. 1884 Benq 327W solar modules were installed. 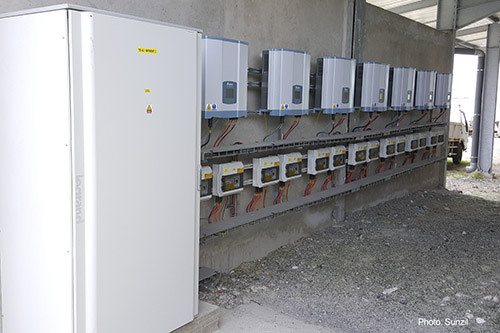 29 Delta RPI M20A inverters (each with a rated power output of 20kVA) were chosen for this PV project. 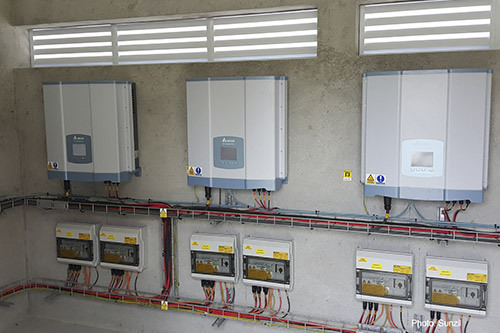 The RPI-series inverters are ideal for tropical climates due to their IP65 protection rating, which guarantees the units are impervious to water spray and humidity. The Delta M20A inverter offers other benefits in tropical environments, such as full power operation at high ambient temperatures and a rugged aluminum chassis that is highly resistant to sea salt corrosion. Additionally, a maximum efficiency of 98.4% helps to ensure that all the available solar energy from the PV system is harvested. Construction of the project began in July 2015 and lasted only a few weeks. The commissioning of the system took place in October 2015. The new solar system now generates around 930MWh of electricity per year, and the hotel is expected to reduce its carbon footprint by about 530 tons of carbon dioxide per year. Delta is proud to have integrated its solar inverters into the photovoltaic system of this beautiful hotel complex, not only to contribute to a clean and stable energy supply, but also to participate in the protection of a first-class tourist destination for future generations to enjoy.